The primary purpose of greaves is to protect the tibia from attack. Greaves were common until around the ninth century, where they largely disappeared. There is not much evidence of their use until the second quarter of the thirteenth century. Almost all greaves used at this time are known as “Demi-greaves”. 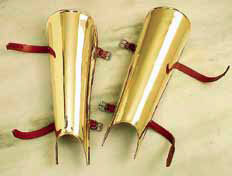 Our Plain Brass Greaves Lower Leg Armour are a simple form of leg protection. These plain greaves are suitable for many historic periods from Roman to Renaissance. Made from brass these greaves include leather straps and buckles. Greaves were not in common use until the 2nd Dacian Wars. Greaves were common until around the ninth century, then again, from the second quarter of the thirteenth century. This page was last modified on 12 May 2014, at 17:27.